Gera on KPFA rappin’ out without histeria! Move the player needle to minute 1:09. 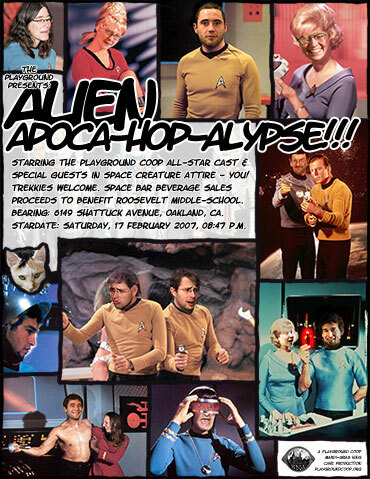 Starring the Playground Coop All-Star Cast & Special Guests in space creature attire – You! Trekkies welcome. Space bar beverage sales proceeds to benefit Roosevelt middle-school. Bearing: 6149 Shattuck Avenue, Oakland, CA. Stardate: Saturday, 17 february 2007, 08:47 p.m.
A Playground Coop Mardi-Gras King Cake Production.